“The Garden of Ideas traces this “emparking the Australian” through a series of conceptually bold and deftly executed sections with telling sub-chapter headings such as “Improvers on the loose” unfolding the story of the first government-sponsored developments in the new colonies. 1. Retford Park, established by Samuel Hordern in 1887. 2. Mendel Garden, Western Australia. I am told that most Federation style gardens have been redesigned or sold off for extra housing! Hopefully not! Here I am going to try to point to good Federation style gardens, gardeners and garden designers of that period. The Garden Suburb movement which influenced our suburbab spread was made possible by improved sewerage and efficient public transport, leading to the practical dream of a Federation house and a garden of one’s own. The Geometrical or formal style, marked by flower beds and shaped borders (the ‘parterre‘ influence) and an influence on the ‘Cottage Garden’. Mixed style, combining man-made landscaping with naturalism, Spatial divisions or ‘rooms’ were inter-related with flowing spaces of informal style. 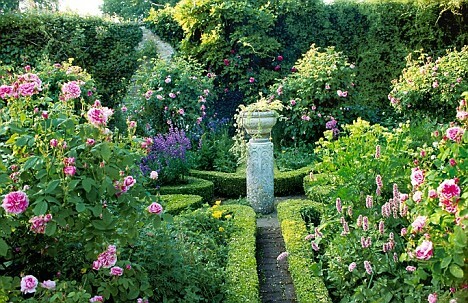 The major English Arts and Crafts landscape professionals wereGertrude Jekyll and William Robinson. They substituted a more casual and painterly approach employing naturalized shrubs, wildflowers, and perennials. William Robinson espoused a naturalistic, picturesque style of gardening. UK architect Reginald Bloomfield set forth a ‘formal’ approach oriented more towards architecture than painterly composition. Edwardian gardens displayed an appreciation of historic gardens, re-introducing both intimate scale and spatial enclosure (‘rooms’), with also the use of topiary and hedging, with loose, naturalistic planting composition in which colour plays and important role. One of the most influential promoters of the Arts and Crafts movement in Australia was architect Walter Butler. He conceived of the garden as the extension of the house, and it seemed logical for the architect to design both. Charles Luffman was an influential figure during the Federation era and championed the new ‘informal’ or ‘natural’ styles, specifically with great emphasis on the small garden. William Guilfoyle was the major landscape figure during the Victorian era, designing the garden at Rippon Lea at Elsternwick. His influence continued in the Federation period. Edna Walling became the twentieth century advocate of naturalistic planting and designed over 300 gardens. Bedding is still in style but architects begin to show an interest in the context of their creations recommending built garden features such as gateways, pavilions, terrace steps, and walls (Fig. 33). These are to be planted with “old fashioned” flowers and trees such as apple, pear, and native trees, surrounded by a mixture of daffodils, yellow tulip, larkspur, bellflower, bachelor button, monkshood, white poppy, white phlox, bleeding heart, briar rose, and peony. Clumps of shrubs are spaced along property lines. Around 1890 foundation plantings of mixed evergreen and deciduous shrubs are sometimes recommended, but the idea of hiding the foundation does not take off until after WWI and does not become common until the 1930s. In the front yard round flowerbeds planted with cannas, caster bean, elephant ears, with coleus and dusty miller edging, are positioned opposite windows, for ease of viewing. Flowers for cutting are planted in the back yard and include china asters, zinnias, stock, and sweet pea. Gardeners avoid the bedding shapes planted in primary colors of earlier Victorian gardens, and showy flowers such as magenta dahlias. Compared with the rigid style of the Victorians, Edwardian gardeners favoured a more relaxed look, with naturalistic planting inside a strongly structured framework. Key features were hedges, terraces, sunken gardens, pergolas and arrow-straight paths adorned with informal planting to disguise their geometry. It was a style that barely changed until World War II. 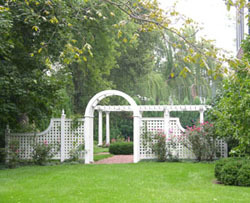 As today, gardens were designed to look like an extension of the house, often featuring a series of intimate linked spaces formed by hedges and trellises. Old-fashioned fruits – and flowers such as hollyhocks and roses – were key plants, with the aim seeming to be to evoke a distant past. The gardens at Hidcote Manor in Gloucestershire, created in 1907 and now owned by the National Trust, are a classic example of Edwardian horticulture – there are hedged rooms with box-edged beds, yew pillars and straight lines are filled with a mix of shrubs, roses, bulbs and perennials such as lavender. But it was gardening guru Gertrude Jekyll (1843-1932) who really popularised this style, which is often referred to as ‘country garden’ yet is more a description of the garden’s atmosphere than of its location. Jekyll also pioneered new ways of using colour: a border, for instance, could start at one end with blue, grey, white, pale yellow and pale pink flowers, graduating to stronger yellows, oranges and reds. Acknowledged as one of the great country gardens of Australia, this magnificent garden was part of the Australia’s Open Garden Scheme for many years. James Fairfax now is the keeper of the English park and garden that features magnificent trees, mature shrubberies and hedged garden rooms, all sustainably managed using organic principles. Rhododendrons and azaleas at their peak in October. Century old bunya bunyas, redwoods and oaks impressed. I recall the more freshly planted Wollemi pines. There’s an impressive collection of classical and contemporary sculptures and that marvellous Guilford Bell swimming pool pavilion. One later occasion on a private visit, Jeffrey Smart was there strolling the grounds. Sadly no painting ever emerged to immortalise the pavilion. The philanthropic former newspaperman James Fairfax intends to gift his historic Retford Park estate in the NSW Southern Highlands. Its envisaged the Italianate 1887 residence will sit within a protected 32-hectare heritage curtilage. It will be preserved in perpetuity for the community with some funds from the neighbouring prestige residential development being directed into a trust which will pay for the long-term upkeep of the home and gardens. The gifting won’t take place until subdivision sales take place. I notice they are progressing quite well. The Old South Road property, which sits on the southern edge of Bowral’s rapidly suburban expansion, has long sat on about 100 hectares including the land now zoned for subdivision. Under the proposal, the 29-hectare eastern part of the estate has been subdivided into rural-inspired lots ranging from 8,000 square metres to four hectares lots. Retford Garden was established in the Federation period. The philanthropic former chairman of the ailing publishing company that bears his family name, first advised he would bequeath Retford Park for the benefit of the public in an article written by me in 2009 in the Sydney Morning Herald. It was his idea for at least three decades. Retford Park has been the country home of the arts patron since he paid £15,000 in 1964 for it on a then four-hectare holding. 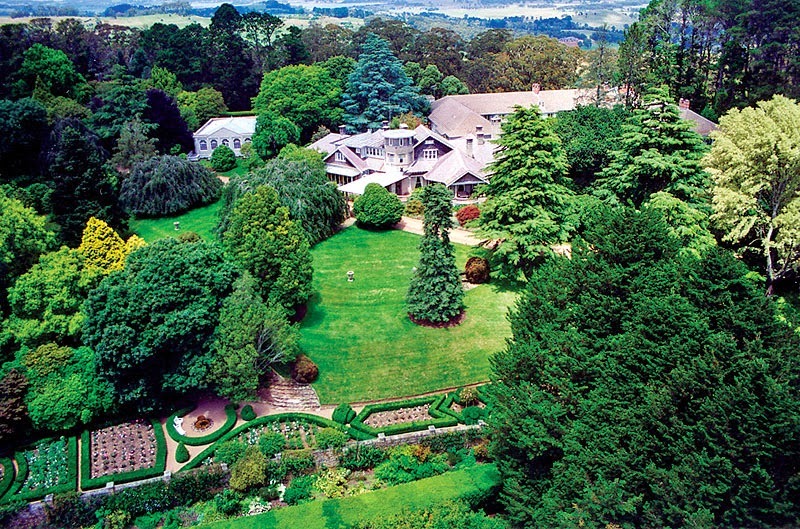 “I think Retford Park is an important part of the heritage of the Wingecarribee Shire area and provision has been made in my will for the house and the immediate surrounding land, including the garden, to be left in trust to be viewed by future generations,” Mr Fairfax told me in 2009. The grounds have many heritage oaks, an enduring association with the Hordern’s retailing business, whose emblem was an oak tree under which were the words: “While I live, I’ll grow”. Retford Park: You can see the bones of Federation Filigree style here. It was first sold after Anthony’s great-grandson, Sir Samuel Hordern, died in 1956, leaving an estate of $279,000. It was briefly owned by the cattle stud operator King Ranch (Australia), of which Edwina Hordern’s husband, Peter Baillieu, was managing director. It occurred to James that it might be a suitable place for his mother to stay on her annual six month visits from England. Fairfax, the eldest son of the late Sir Warwick Fairfax and his first wife, Betty Wilson, then set about regularly buying adjoining rural land. He also set about enlivening the house. “When my offer of £15,000 for the house and 10 acres with an option to buy another 10 in three years was accepted, I went into the usual ‘What on earth have I taken on?’ syndrome, but soon recovered as I got involved in the redecoration which was being done by Leslie Walford,” he recalled to Sue Rosen in 2011. “Some six months later, in the winter of 1964, I commissioned Donald Friend to paint a mural in the dining room,” he said. Leslie Walford, who died earlier this year, said in a 2011 interview with Rosen that he recalled flying up to Mittagong with James to inspect the house. His first impressions of it was “the garden choking the house”. Colour photos courtesy of Highlife Magazine, which reports on life in the Southern Highlands of Australia. 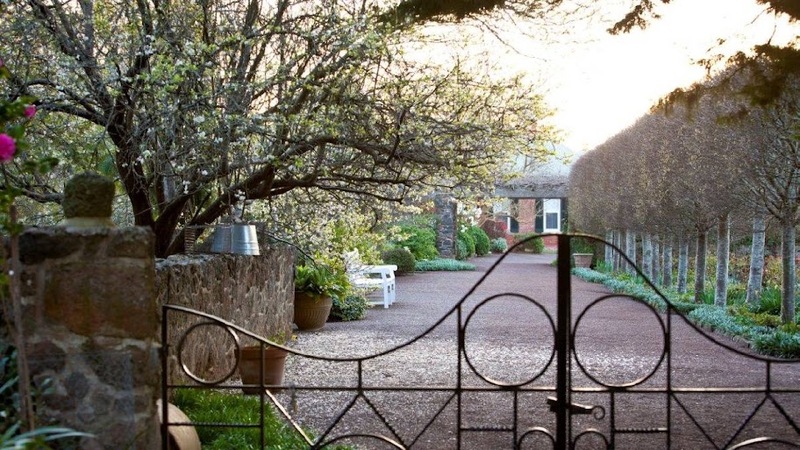 The garden surrounds the homestead of Markdale, a 6,000 acre rural property at Binda, a tiny hamlet near Crookwell in the Southern Tablelands of New South Wales. 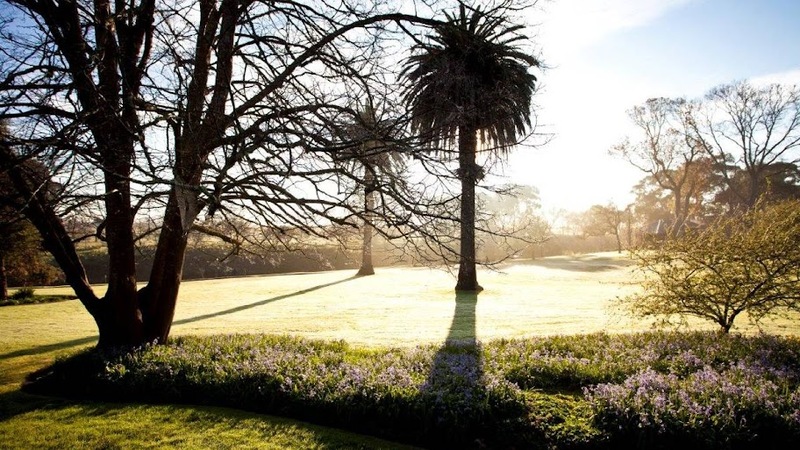 Owned by the Ashton family for three generations, the garden began during the 1920s and was re-designed in 1949 by Edna Walling, one of Australia’s most influential landscape designers. Markdale Homestead. Photo: Danny Kildare. Source: Markdale.com. 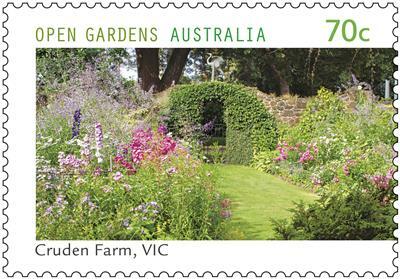 The award-winning five-acre garden is featured in many books and magazines on Australian gardening. Extensively rejuvenated in recent years, it has a wealth of beautiful features including a long pergola of blue and white wisteria, dry stone walls, dozens of specimen trees, sweeping lawns and a beautiful lake with a Chinese bridge. 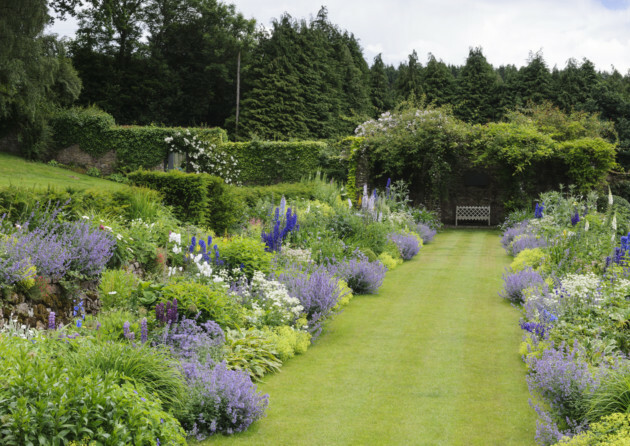 Under the Ashton family’s guidance, the garden retains its strong influence of Walling’s design and plantings. It remains substantially as she planned it – sweeping lawns merging with mown paddock, and informal curved paths leading the eye into hidden depths of the garden and then out to the hills beyond. During her career Walling’s style changed very little, yet each of her garden designs is individual. One of her signatures is the use of stone in low fences, paths and steps to give architectural structure to a garden, and then softening it with dense planting. Her design principles also include creating unity between the garden and the house, while working with the existing landscape and existing features including slopes and trees. At Markdale, Walling’s design took advantage of the glorious natural scenery of paddocks and hills. Framing the garden without obscuring the beautiful views to the hills are magnificent trees including golden elms, golden ash and claret ash, silver birch, pinoaks, hawthorns, aspens, spireas, viburnums and native eucalypts. At the same time Walling was working on the garden, the Ashtons commissioned architect Professor Leslie Wilkinson to redesign the homestead. This unique partnership of Walling and Wilkinson has never been repeated. It was Geoff Ashton (one of four sons of James Ashton who built the original homestead) and his wife, Janet, who hired Walling and Wilkinson. For the past three decades, their son, also named Geoff, and his wife Mary, have maintained the garden, homestead and property. They have thought about selling it on and off over the past decade, and I know would simply love for a buyer to emerge who has a passion for the property. Although Walling’s outline of the garden has changed little, the existing beds have been replanted and developed under the skillful guidance of Mary Ashton. She and her husband took the reins at Markdale in 1983 during one of the worst droughts in recorded history. Sadly, many plants in the garden died during that drought. Faced with the enormous task of restoring the Markdale garden, Mary extensively read and researched Walling’s methods and principles to gain insight into her original intent for its design. 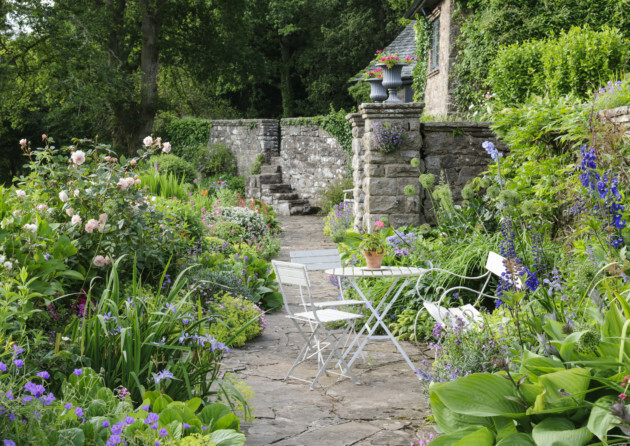 Mary took a careful and considered approach to the garden before developing layers of thick planting in beds and borders beside the stone pathways leading to various garden areas which provide a different view from each direction. But the Markdale garden is as much about the use of space and architecture as it is about planting. One of its focal points is the lake, and Walling was justifiably proud of its design. Among documents held in the Edna Walling Collection, of the La Trobe Australian Manuscripts Collection at State Library of Victoria, is a letter written by Walling to Miss Mervyn Davis that describes her inspiration for the Markdale lake. 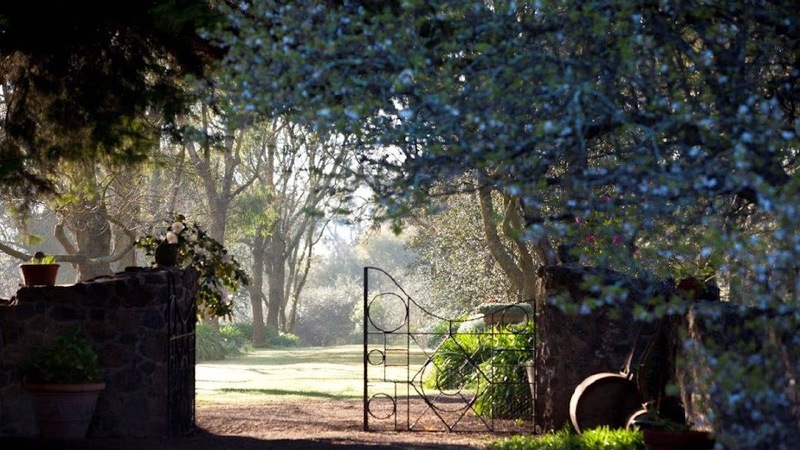 About two and a half hours drive from Sydney, Markdale is a must see for people with a passion for gardens. And at the property, the Ashton family offer self-catered bed and breakfast accommodation for up to 24 people in two original 1850s stone houses and shearers quarters. Banongill Station has a long history. It is situated in the heart of the Western District in the area first discovered by Major Mitchell and settled in the 1830’s. The Mt Emu Creek formed the backbone for these first settlements and in 1853 a blue stone cottage was built here and is now part of the homestead kitchen. Alexander Wilson purchased Banongill in 1873 and it was sold in 1897 to Charles Fairbairn. The Fairbairn family owned the property for nearly 100 years. In 1975 Michael & Diana Lempriere purchased Banongill. They owned the property until 2006 and made extensive renovations to the homestead, farm buildings and totally rejuvenated the garden. 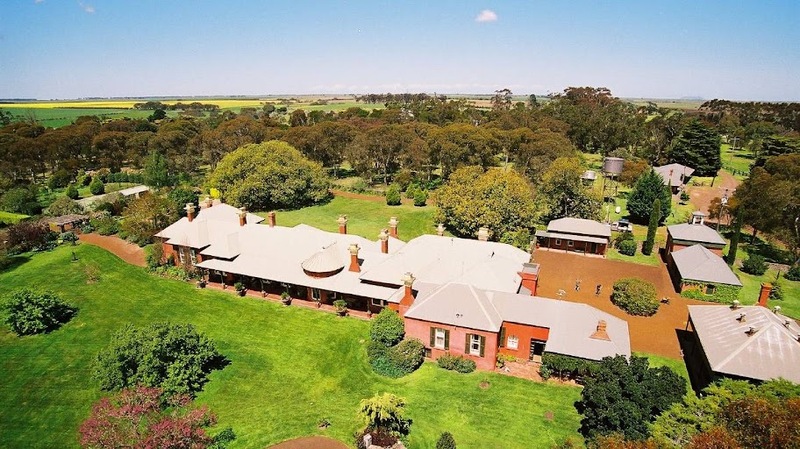 The Banongill garden surrounds the main homestead of a large rural property. It is over 14 acres in size and has the distinction of being only one of a handful of gardens designed by 19th century landscape designer William Guilfoyle. Although the garden was designed by William Guilfoyle over 100 years ago, it is not a garden locked in time. It does retain his distinctive design elements – vast sweeping lawns wide gravelled pathways, unusual plants, rockeries with succulents and the signature feature of three Canary Island palms. This is only part of the garden. 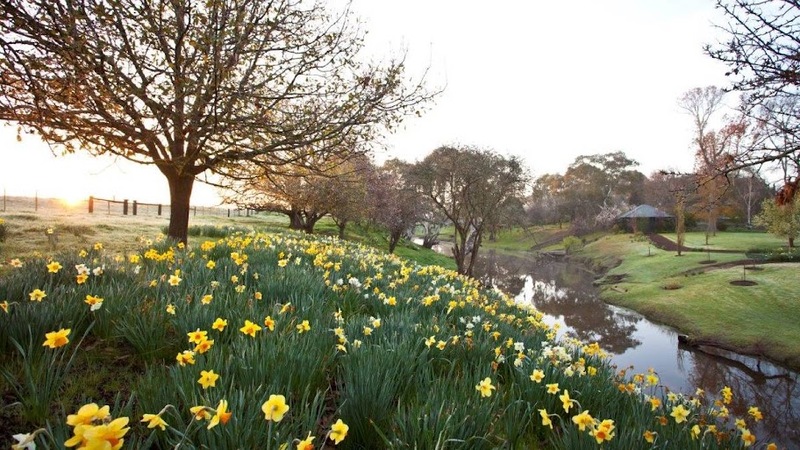 Meandering paths along daffodil strewn slopes, the vast bluestone terraces filled with magnificent spring bulbs, an immense wisteria covered pergola, a hidden grotto, a wild garden festooned with blossoms and bulbs in spring and formal vegetable gardens and orchards. A beautiful bluestone seat is a new addition to the wild garden built, by Michael Sturgeon, and an excellent place to enjoy a coffee. The Banongill Garden, like many other in the Skipton District was extensively damaged by the flood waters from the Emu Creek in September 2010 and January 2011. Unfortunately the swing bridge was swept away and we have been unable to replace it in time for the opening of the Garden. The daffodil display on the Northern side of the creek is very visible from the wild garden on the southern side of the creek. We hope to have the bridge rebuilt in the near future. The very old original bridge into the property was also swept away and we miss having this access to the creek, and we are saddened by its loss. The wild garden is the most changed since the floods. Many trees were washed away from the banks and many others were damaged and needed to be removed. The gardeners removed loads of debris from the main garden in the great clean up. The Garden is still a beautiful place to visit and the vistas and daffodils are as lovely as ever. The Garden is continually evolving and we like others are beholder to nature. The garden you see now is the culmination of nearly 100 years of dedication and care by all previous owners to Guilfoyle’s early vision. I was most impressed by this garden. I had never seen a Crazy Filbert, the daffodil display was colourful and the Wisteria was huge (I just wish I could see it in flower). Some of the trees took my breath away, especially the Oak and the Eucalypts beside the river growing every which way. The owners and their staff are to be congratulated on the maintenace of this garden in what have been very trying conditions. Thankyou for a wonderful day. 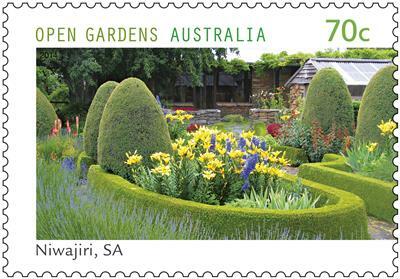 Australia Post is featuring five beautiful private gardens from Open Gardens Australia in a stamp issue. 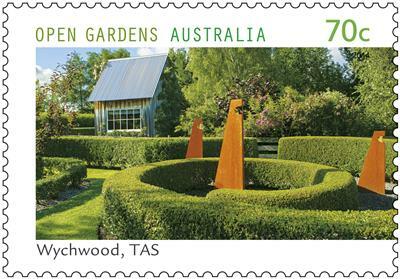 Open Gardens Australia began life as Victoria’s Gardens Scheme in 1987, broadening to become a national program in 2000. Since the organisation’s beginning, it has showcased some 10,000 gardens. Around 500 new private gardens are open to the public each season. It is estimated that around 200,000 adults visit the gardens annually. There are five domestic base rate (70c) stamps and products available from 2 September 2014. 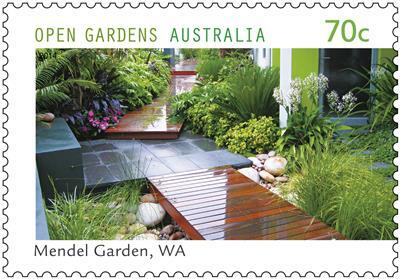 Australia Post gives the green thumbs up! The late Dame Elisabeth Murdoch established the historic garden within a working farm more than 80 years ago, engaging, among others, renowned landscape designer Edna Walling. 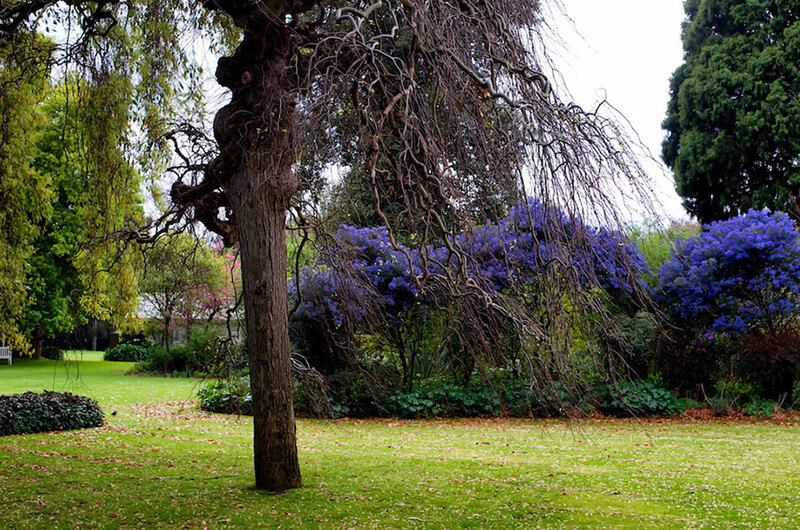 It is a founding garden in Open Gardens Australia. “More than eighty years in the making and the heart of a working farm, the garden at Cruden Farm is a small piece of country set amid dense suburbia. It feels as if it will endure forever. Strong, healthy trees of all ages and hues form its backbone and its character. Grass adds texture – emerald lawns, rough-cut swathes, paddocks bleached in the sun. Water in lakes and pools gives depth, dimension and sparkle. Award-winning landscape designer Janine Mendel developed this wonderful urban garden, which comprises three courtyards, with the stamp showing the lush, subtropical entry courtyard. “Janine believes less is more and that, by its very nature, good design should tread lightly on the planet. “Great design is not about slavishly following current trends. Steve Hailstone developed Niwajiri in the Adelaide Hills in the late 1980s. Displaying European, Japanese and Australian influences, Niwajiri has been meticulously planned and planted. Beautiful – beautiful food, beautiful plants, beautiful sounds smells and textures, and beautiful pictures from every window. Grow abundant fresh healthy fabulous tasting organic food, including plenty for preserves and to give away. “Celebrate the cycling of the seasons. “Abundant flowers to bring inside. First developed in 1926 and redesigned by Helen Cohen in 2003, this water-wise garden reflects the vision of its owners, focusing on native plant species, textured foliage and an informal landscape design. “Very few gardens are as fortunate as 10 Wickham Close, Red Hill. “The garden is made up of more than 4000 plants and 700 different species, most of which are Australian natives, and is visited by more than 50 species of bird. Mr Walcott said they were influenced by the time they spent in south west America, where they grew native plants because they were adapted to using less water and it was more environmentally friendly. This is a superbly designed contemporary cool-climate garden among the rolling hills of northern Tasmania. A focal point in the tranquil garden is a seven-ring classical labyrinth, created through careful grass mowing. The garden at Wychwood, at the foot of the Great Western Tiers in northern Tasmania, is one of the world’s most magical places. Wychwood combines Scandinavian design sensibilities with temperate-climate country-garden charm. And to top it off, the idyllic Mole Creek, which is home to brown trout and a platypus, runs through the back of the property. over 22 years in the making, brought to life by a very special family who dreamt of the simple life in Tasmania. The book details the evolution of the garden from bare paddock to world-class attraction, with its iconic labyrinth, espaliered fruit trees, naturalistic planted beds and curved, clipped lawns. It gives the reader insight into the techniques and secrets that make the design of this garden so successful, offering inspiration and encouragement at every turn, and for every level of gardener. Peter Cooper’s beautiful and haunting photography captures how the garden has transformed with the changing seasons and settled into its surroundings. Published by Murdoch Books and available in Australia and UK in all good bookshops. 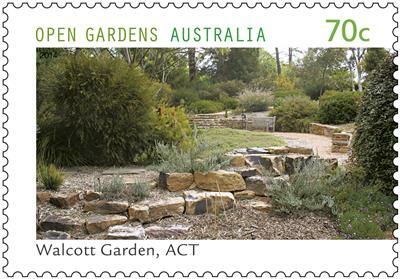 The Open Gardens Australia stamps are designed by Simone Sakinofsky of Australia Post Design Studio, using photographs by Ben Wrigley (Cruden Farm), Steve Hailstone (Niwajiri), Janine Mendel (Mendel Garden), Ben Walcott (Walcott Garden) and Simon Griffiths (Wychwood). Edna Walling designed over 300 gardens between 1920 and 1960 when most women were homemakers. Today her gardens are still considered to add value to real estate. Her achievements and the gardens themselves are acclaimed. 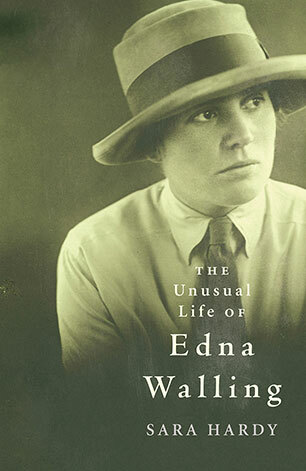 English born Edna Walling (1895-1973) is known today as one of Australia’s … A Gardener’s Log, a collection of Home Beautiful articles, was first published in … Edna Walling was born in Yorkshire and grew up in the village of Bickleigh in Devon, England. When she was fourteen years old she emigrated to New Zealand and three years later moved with her family toMelbourne, Victoria, Australia. Walling studied horticulture at Burnley College and after some years as a jobbing gardener she commenced her own landscape design practice in the 1920s, and “went on to design some significant Arts and Crafts gardens”. In the 1920s, Walling began to develop a village at Mooroolbark on the outskirts of Melbourne called Bickleigh Vale. With its unique collection of charming houses and gardens Bickleigh Vale is one of her most acclaimed achievements. It was designed to be ‘the nucleus of an English village’ and she built the first cottage, named after the village of Sonning on the River Thames in England, as her own home. She sold subdivisions of the land only to people who were prepared to accept designs for cottage and garden prepared by her. In 1935 Walling’s assistant Miss Crouch had her hands ‘severely cut’ breaking a window to free two cats after a fire started at Sonning. In 1926, Walling began contributing regularly to Australian Home Beautiful. Her design practice grew and she worked across Australia, in Perth, Hobart, Sydney, and Buderim in Queensland. 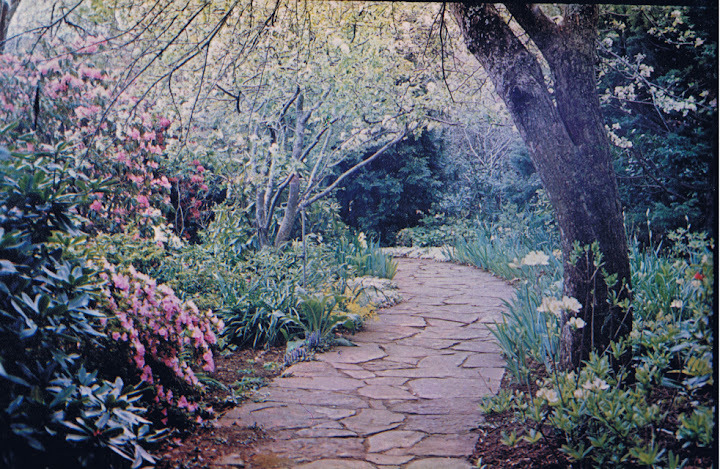 Her Victorian commissions included designing the lily pond for Coombe Cottage,Dame Nellie Melba’s residence inColdstream, in the Yarra Valley Ranges; Durrol for Mrs Stanley Allen at Mount Macedon; Rock Lodge garden for Mrs PF O’Collins in Frankston; Cruden Farm garden for Mrs Keith Murdoch (later Dame Elisabeth), Langwarrin (Gardening Australia website: Cruden Farm). One of her most intact NSW commissions is Markdale, Binda (). Her plans from the 1920s and 1930s show a strong architectural framework with ‘low stone walls, wide pergolas and paths – always softened with a mantle of greenery’. She later drew inspiration from the Australian bush, creating a more naturalistic style with boulders, rocky outcrops and indigenous plants. In small suburban gardens, Walling created garden ‘rooms’ in order to make the garden appear far larger than it actually was. Her designs were heavily influenced by her experience of the Devon countryside as a child and designers such asGertrude Jekyll. In the 1950s, Walling became interested in the conservation of roadside vegetation and was a prolific writer in the press on the subject as well as her 1952 book The Australian Roadside. According to Trisha Dixon, Walling was an important influence on Australian gardening, steering tastes away from an Anglo-centric heritage towards a respect for the Australian climate and landscape. In 1967, she moved from Melbourne to Bendles at Buderim in Queensland, where she had hoped to further develop the village concept but it did not progress. Despite her ill-health during her last years at Bendle, Walling continued to write prolifically, rewriting manuscripts, corresponding to newspapers on environmental issues, and trying to republish her books. About a quarter of Walling’s designs survive and these are held in the State Library of Victoria and in private collections in Tasmania, South Australia, New South Wales and Victoria. John visits Bickleigh Vale Village, designed by legendary gardening designer, Edna Walling. 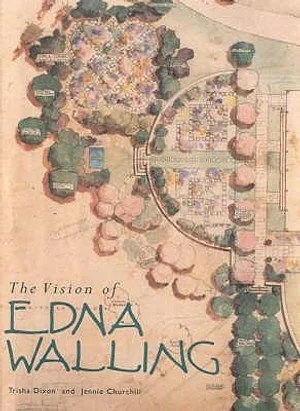 Edna Walling was Australia’s greatest garden designer between the 1920s and the late 1950s. She was born in England, but migrated to Australia when quite young and studied horticulture at Burnley Horticultural College during the years of the Great War. 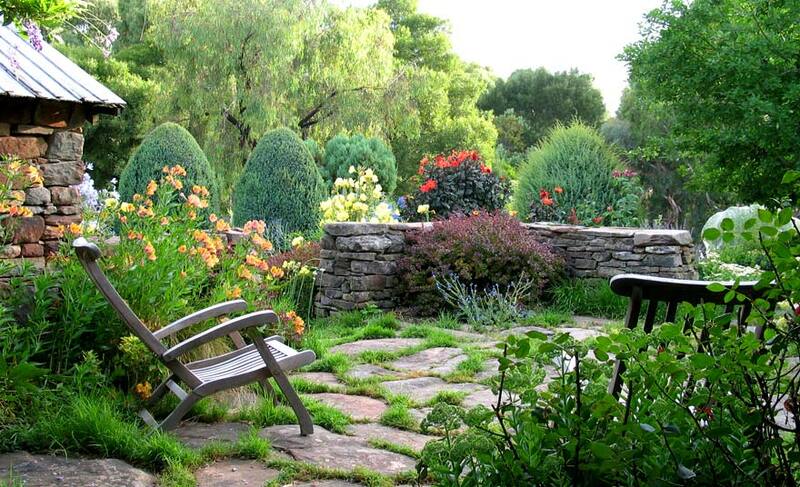 In the 1920s, she set up her landscape design practice. Although focusing primarily on Victoria – Melbourne’s western district, the Macedon Ranges and the Dandenong Ranges, she also designed gardens over the greater part of Australia. One of her greatest achievements is the wonderful collection of houses and gardens at Bickleigh Vale, to the east of Melbourne, where she not only designed the garden, but the houses also. Bickleigh Vale is the epitome of Edna Walling. It is named after a village in Devon where Edna Walling grew up. The cottages, which are located along a cul-de-sac, have British names too. There is ‘Glencairn’, ‘The Sheilan’, ‘Downderry’, ‘The Barn’ and ‘Badgers Wood’. * Cottages that sit in the landscape setting without dominating. * Beautiful stonework in the buildings and the paths, which don’t intrude on the lawn. * A series of outside rooms. * Sensitivity to site – quite relaxed, informal and romantic. * Plant massing to frame the lawn that spreads through the garden, leading the eye. * English cottage plants such as helabore, azalea, daphne, berberis and viburnum. * Trees include oak, beech and birches. * Gateways that link the cottages.